The delegate of Maine presenting. Woke up Sam with kisses when I arrived home from the Mom Congress last night. It was one of the most vulnerable moments I have ever witnessed in him. The boys did beautifully thanks to the amazing net of support we have woven over here. I am really beyond words as far as thanks to my village! Looking forward to sharing with you all about the power packed three days as the delegate from Maine at the first ever Mom Congress in Washington DC. I promise that I will do so when I land a little bit first as the mom from Maine. Here’s a link to Secretary of Education Arne Duncan’s speech/town hall on the 270 million dollar funding initiative to increase parental involvement in education that he unveiled at the Mom Congress, Monday at Georgetown University. Yours truly enjoyed the honor of being on stage with the other moms for his inspiring, and encouraging speech. His call to hold each other accountable in the next steps that we need to take was a refreshing approach in my eyes. You OWN that podium. Looks like you resolved (with style) the “what to wear” issue! Congrats on accomplishing a very cool goal. Welcome back! Looking forward to reading all about your experience. Bar B-Thank you! I’ll try to write more about it soon–as I figure out what to say. All sorts of experiences and reactions that I am sorting out..Looking forward to reconnecting with you too! Feel out of touch. Wow – you look like you are taking people to school up there lol! Can’t wait to read how it went. (Oh… the Sam moment – tears – as usual – clearly my pregnancy and your blog are a very emotional mix lol). Taking the people to school! I LOVE that. What an apt expression. You crack me up. Looks like you did so good!! (I know the proper word is “well” but there is something that I mean that “good” says and “well”– well it just does not.) 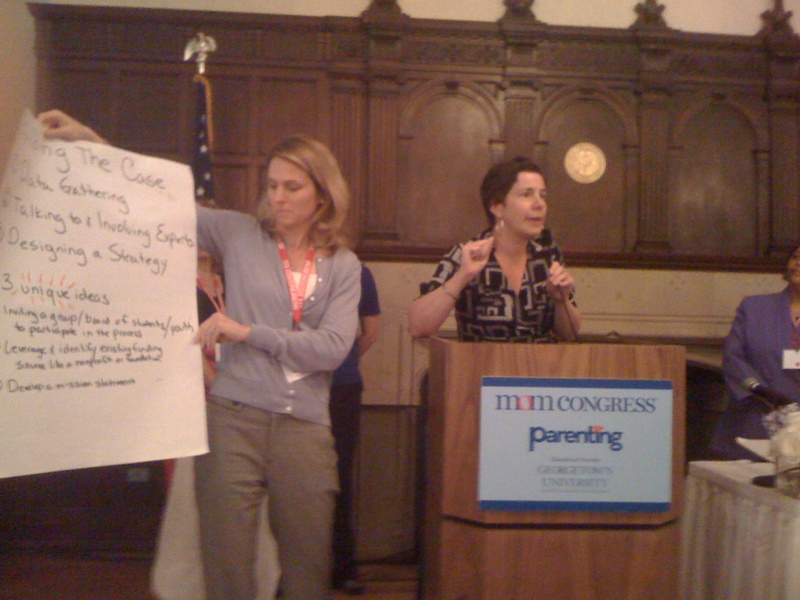 I want to hear all about this Mom Congress and understand it better– and then if it’s as cool as it seems it would be, I’d like to follow in your footsteps and hopefully get to go as a delegate myself sometime. How ’bout that? I do see that DC got a delegate to the Mom’s Congress– even though we still don’t have a voting member of the US Congress. Hmm, no surprise– Moms are in the forefront. Laura–and the DC delegate was AMAZING. Yes–it was very clear that the movers and shakers out there in the big world are many a Mama! More soon about what it was, and what it might become. You would be an amazing delegate I am certain! Looks like a power packed 3-day event. Your voice was certainly a necessity. I can’t wait to read all the nitty-gritty details and also to hear how your two darlings handled it.